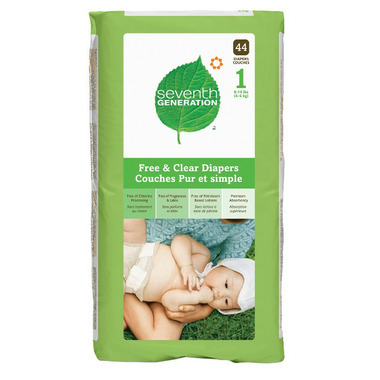 Seventh Generation Chlorine Free Diapers offer soft, cloth-like comfort and premium absorbency. In addition to keeping your baby dry, our super absorbent polymer is non-toxic and non-irritating to baby’s sensitive skin. Featuring stretchy leg gathers and resealable closure tabs. The colour of disposable diapers is typically achieved through the addition of color pigments to their inner and outer cover materials. This is also true for Seventh Generation diapers. While most designs on the market use pigments that result in a white colour, we use a small amount of blended colour pigments to impart a tan color to our diapers. The blend is proprietary to the supplier of the pigment. To the best of our knowledge, there are no known toxicity issues associated with the use of these pigments in our diapers. Without the addition of colour pigments, these materials would be colourless, much like a plastic milk jug. We use brown pigments to help distinguish Seventh Generation Chlorine Free Diapers from others in the marketplace that are bleached with chlorine-containing substances. All disposable diapers, including Seventh Generation’s, rely on man-made materials to deliver the high-level performance that parents expect of modern diapers. These materials are mostly petroleum-derived and are not renewable, which adversely impacts the environmental footprint associated with these products. At Seventh Generation, we are pleased to offer an alternative that is not bleached with chemicals containing chlorine, and are working hard to further improve the sustainability of our diaper products. Love these diapers. Great fit and leakage protection and no obnoxious prints on them. Perfect for newborn pics where you don't really want elmo in the picture! I was impressed. No leaks and great fit. I also like how they have a natural smell, versus the chemical odor given off the big name diapers. Very good environmental friendly product, absorbant and very thin compare to other i have been using before (Mammazone). Only negative point : easy to torn (close to the velcro parts) when you try to put it too fast. I love these diapers. They are super absorbant, so much so that I can use them overnight on my one year old. They fit well, they have never leaked on me, and they don't have all those chemicals and fragrances that other diapers tend to. Highly recommend. Best diapers. These are the only diapers we'll use on our 8 month old. Sure, we get the odd "blowout" or wet crib, but these are the only diapers that don't irritate her or give her a rash. I'm definitely a fan, I had been using Earth's Best previously but find these to fit better on my baby and I believe them to be more absorbant. I Love these diapers!! I am very sensitive to chlorine so when my baby kept getting a nasty diaper rash I had a hunch that that was also the problem for him. Since I have been using these his skin has been beautiful! Also, They hold just as good as any other diaper! We were quite happy with these diapers. They fit our chubby baby quite well. Unfortunately, they do not hold in a poopslosion very well because the absorbent material does not extend very far up the back. However, we would buy them again for sure. We use cloth diapers but bought these to use during a camping trip. I was surprised at how much these absorb. Our baby's sleeping 12 hr nights and there were no leaks. No rashes either. I'll be buying these again. We have been using this diaper since my baby was born. He is 9 months now and he is using stage 3 diaper. This diaper is no leak, not scented, no diaper rash. I have used these diapers (along with cloth diapers) for my sone since he was born and they have been great. The only problem I found was that when he was getting to the higher end of the weight range for the diapers they started leaking. Maybe he was just to big size-wise rather than weight-wise. We cloth diaper and use the potty but these are great for just in case at night! Love Seventh Generation! I love that these are Chlorine free and I love that they work so well. All other diapers I used with our first leaked and these ones are great!! Our absolute favourite diapers. Zero diaper rash! We do have quite a few "explosions" with these, but a little extra effort on the laundry far outweighs the rash we experienced from other disposables as well as cloth diapers. Fabulous product!!! I use cloth diapers while at home but I like these for road trips and weekends away. I like that they aren't full of chemicals on my little ones bottom and they work very well. These are great as a more environmental option. I was disappointed to see Lorax cartoons printed on these diapers, as opposed to the first few packs of seventh generation diapers I bought for my newborn. Can't seem to get away from the logos! But the price, diaper quality and convenience of having them delivered through well.ca means i'll be coming back for more. We use cloth diapers during the day, but those a perfect for the nights. I have tried many different kinds since my first son was born but I always go back to these. Pretty decent adsorption, few leaks, a little better for us and the environment than regular diapers, and thus of course a little more expensive. The best diapers! No rash, less leaks, seem comfy, more natural. And well.ca had them at a great price! Plus free shipping, that is a good deal. Thanks! I tried several of the more "natural" disposable diapers; these are by far the best. Used them daily for nearly two years. Unscented and don't feel plasticy at all, and yet they aren't stiff like some -- they're still flexible and comfortable and fit snugly. I normally cloth diaper, but use these for weeks away. We've never had a leak and I love that these aren't scented like some of the other diapers I've tried. These diapers do the job well. They are unscented, solid, they do not leak (unless you are using a size too small, then they leak). Leak like other dipers, but much less rush. And no odor at all! Pretty solid diapers as a slightly more environmentally friendly disposable kind. I've tried many other brands (such as Natty which seems to have so many defective ones). Just think it's a bit goofy that they dye the diapers brown to make them look more recycled. Goofy. I love that these diapers are unscented. No rashes since we've switched to them! I find they fit a bit better than the standard brands, with the elastic on the back, etc. Have never had any gel crystals break through with these either. Also, moisture doesn't wick through to the outside of the diaper, leaving a damp bottom...unlike with the standard brands. These diapers are pretty good but sometimes leak if baby has a big poop. Love that they are chlorine and fragrance free. The fit is also good. I'm not sure if this is true but recently these diapers I loved so much have changed their tabs and the absorbency seems to have decreased. My 7 month old now cannot go 10 hours through the night in these like he could before. Sadly we've had to switch to a different brand. I'm a cloth diaper girl, but when we need a disposable these ones have been good. We have not had issues with rashes and we love the fact that there is no scent and chlorine free!!! I love this company but unfortunately the diapers aren't working for my newborn. I cloth diaper during the day but at night use disposable for now, and he leaks through every night. They seem fine during the day if I use them when we're out and he's not just lying down, but after 2-3 hours in his bassinet, when I pick him up to feed, he's soaked through. We are a cloth diapering family, but when we need a disposable these ones have been good. We have not had issues with rash and we love the fact that there is no scent and chlorine free. We love how soft the diapers are and how nicely they fit our 16-months old daughter. Using these affordable, relatively chemical free, entirely scent free diapers keep our little one comfortable and our pocket book happy! Strongly recommend this product. I used to use this product all the time a couple years back, but did that they changed their product? The tabs seem different (cheaper), but still a good product and I live the no chlorine. Also very absorbent. Better than most commercial brands. When we can't use cloth, we try to use these. Fit well. Great diapers! Although there are not 100 percent chemical free they seem to be better then the commercial brands! I love the extra band in the back of the diapers, makes them more snug! I love these diapers. My daughter has worn them since birth (when she's not in cloth) another brand of diaper upset my daughter's skin, these do not at all. Love these diapers! Work just as well as Huggies but my little man doesn't end up with the diaper rashes he gets from diapers full of chemicals! They fit well and we've had no major blowouts yet! Having been continuously using these diapers for my kids when I was first introduced to them about 5 years ago! they have never failed me. Highly recommend them! Totally vouch for the quality, absorbancy, and corporate ethics behind this product. great "green" alternative, they fit good, and no leaking. Love these diapers! The package claims to have a "better fit" and I found they have improved since I last used them. The tabs are stretchier and they fit more like Huggies, whereas before I always bought one size bigger than I would have with one of the conventional brand diapers. Very happy with these diapers. The fit is great and no leaks. Fit very well. Never have a problem with leakers. Much softer/more form fitting than other 'green' diapers I have tried. Usually use cloth diapers, but these are the ones I use as backup - they're awesome. My daughter has used only these diapers since her daughter was born and the baby has suffered from absolutely NO diaper rash! So happy baby - happy Mom and even happier Nana!